"Religious Education makes a distinctive contribution to the school curriculum by developing pupils' knowledge and understanding of religion, religious beliefs, practices, language and traditions and their influence on individuals, communities, societies and cultures. It enables pupils to consider and respond to a range of important questions related to their own spiritual development, the development of values and attitudes and fundamental questions concerning the meaning and purpose of life." *To provide opportunities for all pupils to learn and to achieve. *To promote pupils' spiritual, moral, social and cultural development and to prepare all pupils for the opportunities, responsibilities and experiences of the present and the future. Our scheme of learning is enquiry-based. Christianity is taught in every year group, with Christmas and Easter given new treatment each year, developing the learning in a progressive way. Buddhism, Hinduism, Islam, Judaism and Sikhism are also covered. Humanist perspectives are added when appropriate in some enquiries. Our belief is that, using an enquiry-based model well, children’s critical thinking skills can be developed, their motivation to learn increased, and their knowledge and understanding of, and empathy with people and their beliefs, religious or otherwise, will be enhanced. This approach takes very seriously the philosophy that children are free to make their own choices and decisions concerning religion and belief. RE does not try to persuade but rather to inform and develop the skills with which evaluation can take place. Monday 18th December 2017 was a very special day for the children as we explored key questions linked to the Christmas story. Year 1: What gifts might Christians in my town have given Jesus if he had been born here rather than in Bethlehem? Year 2: Why do Christians believe God gave Jesus to the world? 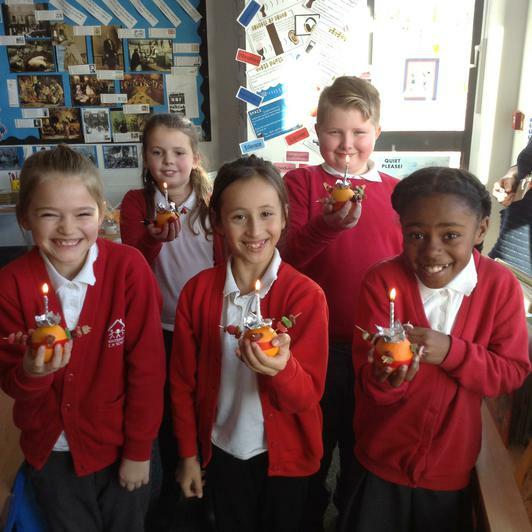 Year 3: Has Christmas lost its true meaning? 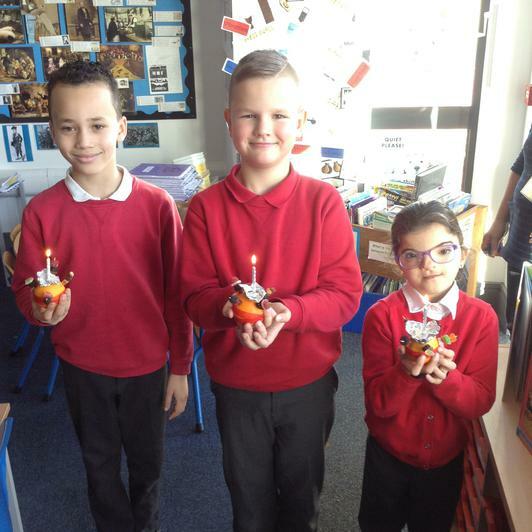 Year 4: What is the most significant part of the nativity story for Christians today? 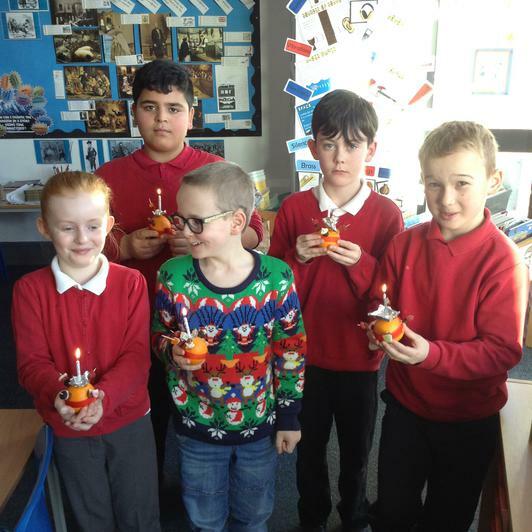 Year 5: Is the Christmas story true? Year 6: How significant is it that Mary was Jesus’ mother? 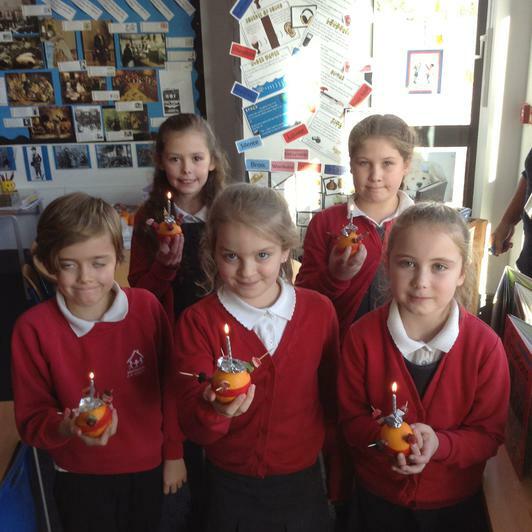 Here are some Y4s with their Christingles. They learnt about the symbolism of each part for Christians. In our school, religious education actively promotes the values of truth, justice, respect for all and care of the environment. It places specific emphasis on children valuing themselves and others, on the role of the family and the community in religious belief and activity, on the celebration of diversity in society through understanding similarities and differences, and on human stewardship of the earth. 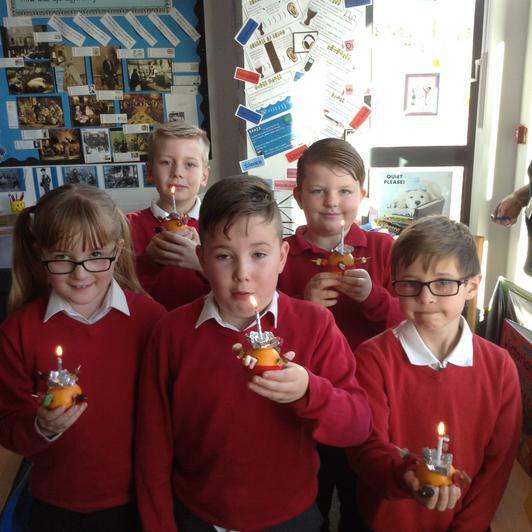 The religious education curriculum also recognises the changing nature of society, including changes in religious practice and expression and the influence of religion, in the local, national and global community. Learning about Religion and Belief - a bit like a window through which pupils look from the 'safety' of their classroom at people practising their religion and then explore what is happening and why. Learning from Religion and Belief - a bit like a mirror in which pupils see themselves and maybe their friends' faces too. It is a chance to evaluate different religious practices or beliefs and ask questions or express their own developing ideas.